You are currently browsing the Pontiac Paradise Shop Talk weblog archives for March, 2010. Finally! 65 to 68 Catalina & GP Trunk Pan Set! After months of waiting, PontiacParadise.com annoucunces the availability of 65 to 68 Catalina and Grand Prix Trunk Pan Sets. These only fit Catalina 2 door models (sedans & hardtops) and Grand Prix models. They do not fit convertibles or Bonnevilles or Star Chiefs either. All together, there are 4 different trunks used in 65-68 full size Pontiacs. 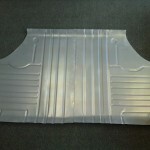 Next up will be 65 to 68 Bonneville & Star Chief convertible and four door Trunk Pan Sets (done as of 8-20-2010!). Looking for the other two patterns….65-68 Catalina four door/convertible and 65-68 Bonneville 2 door hardtop trunk pans in good enough shape to use as patterns. These are in two pieces for easy installation. PontiacParadise.com will be reproducing the 65-68 Trunk Mounts also, however the 61-64 Trunk Mounts can be substituted as they are almost identical. $239 plus $75 UPS shipping in the lower 48 states. IN STOCK NOW!!!! Second Reproduction Part in the works! 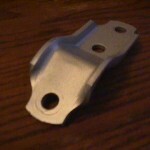 PontiacParadise.com is set to release its second reproduction part…the 1965-1968 Z-Bar Bellhousing Bracket with or without Ball Stud. This part was being provided in the last couple years by a person fabricating them and selling in Smoke Signals. They functioned correctly however did not look like the original item. He ran out and apparently did not want to make any more so we stepped in and made our an exact reproduction. As with all our reproduction parts, they are made in the USA right here in the Twin Cities and use US made steel. This bracket bolts to the bellhousing and holds up the Z-Bar on the engine side for 65-68 full size cars. Price is $64.95 w/o the ball stud or $81.95 with. Shipping is $6.80 USPS Priority Mail. These started shipping on April 12, 2010. Call Les at 651-280-9681 to order now.